The comics world is buzzing about DC Comics' upcoming Futures End 3-D issues, and the first wave of issues arrives this Wednesday. Let your friends know this is their last chance to save 20% on every Futures End 3-D issue!Plus: for every issue ordered between now and 9/24, customers will automatically be entered into our Futures End Contest. Two winners will receive all 41 Futures End 3-D covers, while one Grand Prize winner will get all of the Futures End 3-D covers, plus all 52 of the 3-D Villains Month comics from 2013! Spread the word now using the Share buttons at the bottom of this article! 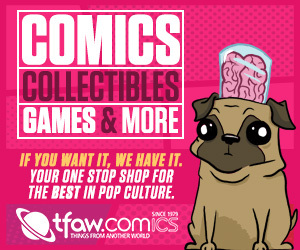 We've also listed the hottest new comics, graphic novels, toys, statues, and more below. Don't miss out!